Sterling Children's Books, 9781454919599, 32pp. 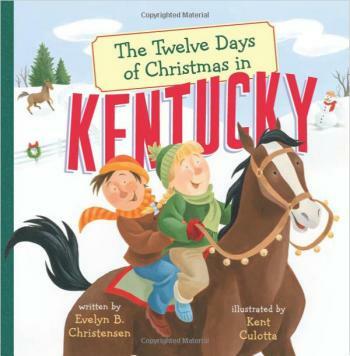 Merry Christmas from the Bluegrass State Come along on a wild ride through Kentucky as Marybeth introduces her cousin Martin to all her favorite places, activities, and foods. While they travel from Lexington to Louisville to Paducah, Marybeth gives Martin some really cool gifts--like 4 lucky horseshoes when they visit the Kentucky Derby and 10 lumps of black gold from the Coal Mining Museum in Benham. This joyful entry in "The Twelve Days of Christmas in . . . " series entry features terrific art and lively text by a native Kentuckian that perfectly captures the state's spirit. A former teacher with a doctorate in education, Evelyn B. Christensen loves to make learning fun. She has designed several math games and authored more than 40 educational puzzle books, including Kentucky Puzzles: Bluegrass Brainteasers for Ages 6 to 106. Some of Ev's favorite things are waterfalls, rainbows, snow, wildflowers, fireworks, and her native state of Kentucky. She lives with her husband in Lexington, KY. Try some of Ev's puzzles at evelynchristensen.com. Kent Culotta has worked as an artist in newspapers and film, including several years in the animation industry. He has vivid memories of driving through Kentucky and seeing hills with miles of white wooden fences snaking across them, dotted with all those beautiful horses. He is the illustrator of Dan the Taxi Man and Busy Trucks on the Go, both written by Eric Ode and published by Kane Miller. Kent is a member of the Society of Children's Book Writers and Illustrators, and currently lives with his family in sunny Southern CA. Visit him online at kentculotta.com.